Boredom? It’s a risky business! Bertrand Russell said that half the sins of mankind are caused by the fear of boredom, and some people certainly go to great lengths to avoid it. 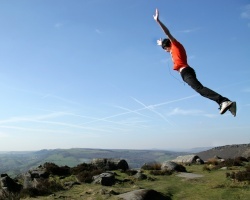 Psychological research has shown significant differences between ‘ordinary’ people and those who engage in thrill-seeking pursuits such as mountaineering or base jumping (jumping from a high place and freefalling before opening a parachute). These people know the risks they are taking – they must know, because the high injury and death rates are so striking – but for them, the excitement of the activity still outweighs the risk. While most of us can perhaps understand the lure of conquering mountains and oceans, deaths or injuries from other more recent crazes seem altogether more futile. In January this year, for instance, a young father plunged to his death over the side of a mountain while zorbing (rolling down a track inside an inflatable ball) – not a very dignified way to go. Jumping into the sea from high places is nothing new, but now it has a name: ‘Tombstoning: The terrifying new craze in Britain in which children as young as 11 leap from clifftops into the sea… and some children are paying a terrible price’ shouted the Daily Mail newspaper last summer. According to the UK Maritime and Coastguard agency, tombstoning has claimed 20 lives and left 60 others seriously injured. Being primarily an activity of impetuous youths and involving a significant element of peer pressure, this particular fad is certainly the stuff of parents’ nightmares. One might expect the internet craze for planking to be risk-free, but even this seemingly benign activity, which involves being photographed lying face down in unlikely places with the arms touching the sides, has apparently cost at least one life. An Australian man fell to his death from a hotel balcony while attempting to plank on some railings. Perhaps it was inevitable that, as people competed to post photographs of themselves planking in the most unusual locations, risks would be taken. There have been reports of people planking on railway lines, in the middle of roads, and – in one particularly foolhardy escapade – on the roof of a police car. Nevertheless, planking was enough of a success to spawn several follow-on crazes such as teapotting (where participants pose with arms crooked in the manner of a teapot), owling (crouching down to imitate an owl), and batmanning (hanging upside down by the feet). Google provides many entertaining images to illustrate all of these. The dangers of new crazes are not all physical. Although milkers received some criticism relating to the waste of milk, that was nothing compared to the backlash faced by students from the upmarket location of St Andrews in Scotland who responded to milking with their own champagning video. A wave of outraged responses soon led to its removal from YouTube. There will always be adrenalin junkies willing to scale forbidding rock faces or risk being gored by a bull, just as there will always be those who can’t resist a stunt, however silly. One theory says that thrill-seeking is an innate part of the human condition, one that goes back to the days when we needed to hunt animals and defend ourselves from predators. Although some people may object to picking up the bill for the resulting accidents, these activities may in fact provide a useful outlet for our adventurous impulses, impulses that might otherwise be directed in much more destructive directions. and while the time spent reading this article will always be lost, the condition known universally as ‘batshit crazy’ will always be found. So much of the gobbley gooks of double talk. n. writing which uses complex phrases and fancy words, vague bureaucratic jargon (Babylon)//Date:1944: : wordy and generally unintelligible jargon (Merriam-Webster). Double talk seems something else entirely. And, although I respectfully agree with Matthew that we are not to stand in judgment of our fellows, it does seem a bit foolish to put at risk the gift from Heaven that is life in pursuit of these pointless dares. May we are all guided to follow the straight way. We can feel the happiness of being forgiving, generous and tolarant with others. We can see our own flaws and errosr instead of others’ and try to ractify them so that none of us turn to any sort of castigation. You have helped broaden my schemata on new crazes. I may try some of them out. There is a saying “Empty human mind gives room for evil thoughts.” So guys if you are empty minded you can still use some of the tips mentioned in this article. atleast it’ll keep your mind occupied….